The software is user-friendly with an intuitive graphical user interface. The software that needs to be downloaded and installed on the user system almost installs itself with the user only needing to play a very small role in the installation process. Wizards are included for every possible function, and wizard screens effortlessly guide the user through the configuration process. The application allows users to schedule, compress, encrypt or filter backups. Restores can be done at the click of a button. DR Imaging offers protection and recovery of the complete system. The highlight of the software is the backup wizard, which guides the user through the selection, backup and restoration of files that are considered mission critical, to local drives, network devices, or online storage repositories. This ensures complete data protection and makes for high availability of data at all times for local restore, bare metal restore, or file restore from a remote location. The add-on utility, Central Management Console will allow administrators or service providers to manage all backup and restore processes via remote access. NovaStor specifies a minimum System Requirement for the workstations and servers to be protected. NovaBACKUP for workstations, servers or virtual machines requires Pentium III or better, 512 MB of RAM minimum, 450 MB free hard drive space minimum, Internet Explorer 7.0 or higher, TCP/IP network, additional hard drive space is required for backup to disc and CD/DVD and temporarily enough local space for all virtual machines in one backup job. NovaStor also maintains a support department with technical, expert advisors. All users are granted free access to NovaStor’s self support portal. For personal assistance, NovaStor also offers priority support plans, one time support plans, and self support plans. Priority support plans for single workstations and multiple workstations/servers are charged plans. While Email & Call Back basic support command a charge of $29.95 for single workstations and $79.95 for multiple workstations, the Phone Premium support plan is charged at $49.95 for the single workstation and $149.95 for multiple workstations. One time support options include per incident support ($49.95), Installation support ($99.95), and Data Restore Support ($149.95). The Data Protection Architecture Support is under development and is expected to be charged at $249.95. Self Support includes Support Forums, Knowledgebase, Videos, Webinars, Training and Documentation. Self Support is freely accessible on the website. Free Support includes all the self support material and complementary email support for up to 30 days of purchase on any product. NovaStor is not a direct service provider, and sells software licenses only. While it does not provide backup services to customers directly, or own a data center, it works entirely with and through its partners, resellers, distributors, and managed service providers to ensure that their customers get local data protection and offsite backup solutions via the Internet that are readily accessible. Tailor-made partner programs are also designed to hone up partner skills and help them deliver quality services to NovaStor customers across the globe. Trial runs of the software reinforced the market reputation of the company. The software installed smoothly, instantly and automatically leaving the user with very little to do. Once up and running the backup/restore/disaster recovery operations were launched and completed with no glitches or blips confirming the proven track record of the products. NovaBACKUP is certainly a must-have for any organization that is serious about data protection and disaster recovery. 2. Easy to install and quick to implement. No prior IT-knowledge required. 9. Excellent support services from experienced personnel who have developed the product. 1. Backup and restore speeds leave much to desire if one wishes to compress or decompress a file when performing a backup or recovery job . If the files are compressed before backup or decompressed before restore, the operation takes much longer, as the compression and decompression process itself can be a bit time consuming. However, the most recent release has an improved speed for compression/decompression, and it is hoped that the company will continue to pay special attention to improving its product in this area. 2. The product pricing may be another area of concern for individual users. The individual user can expect to invest $49.95 – $149.95 for backup, restore and storage of data from a single workstation or server. However, the products are feature-rich and extremely efficient and that may be a justification in itself for the investment. Also, coupons can be found online for NovaStor’s individual user and SMB software which drops these prices significantly. Positioning: NovaStor is a leading international provider of software solutions for data protection and availability. NovaStor provides software, SaaS solutions and services for local and online backup, restore and retention of business-critical data. Clients include home, mobile, and SMB users, service providers as well as international corporations. NovaStor’s cost-effective solutions are platform and hardware-independent and ensure that optimal technological and economical use is gained from the customer’s existing and future IT environment. NovaStor is headquartered in Switzerland (Zug), has offices in Germany (Hamburg) and the USA (CA, Agoura Hills), and is represented in numerous other countries through partnerships. Trial versions of NovaStor’s software products for single workstations, servers, virtual environments and medium-sized networks are available for download on the company website. For the purposes of this review, we have downloaded NovaBACKUP Business Essentials for protecting a single server, including Microsoft Exchange and SQL. However, the installation process for all flavors of the backup software is similar and the steps detailed herein will be sufficient to guide users through the installation process for the other versions for single workstations, servers and virtual machines. To download the trial version of the software, users must click on the download button available on the Download page of the website against the appropriate version of the software. Users who decide to buy the software after the trial will receive an activation link via email after payment of the requisite charges to NovaStor. The activation key code must be entered at the appropriate input box after purchase in order to activate the product. NovaStor software is available in several languages — English, German, French, Italian, Spanish and Simple Chinese. Upon double clicking the installation file, the first screen prompts the user to select a language. After viewing the welcome screen and accepting the terms of license, the user can proceed to install a typical or custom version of the software. Typical is the recommended option for novice users. Custom installation may be attempted by expert users. The SetUp Wizard then takes over the task of installing the software. The whole process takes a few minutes with an option to cancel the installation at any point of the installation process. On clicking Finish in the final screen of the wizard, the setup is complete and users can choose to launch the software immediately. The next step in the installation process is registration. If you have obtained a license for the software, the key code may have to be entered by clicking the Add Key Code button. For trial versions of the software, a 15-day license key is automatically input into the relevant text box on the screen. The user must then click OK to complete the registration process. A central dashboard (with a simple and advanced view), is available for a quick view of the status of backup and recovery or to access to the different parts of the application interface. Users can easily select the files and folders that they want to backup, copy or restore from the set of documents, music, email or pictures available on their desktop/laptop. They can access the backup, restore, copy and DR Wizard or quickly access the online storage. The major utilities for running a job, opening a job folder, importing media or invoking the virus scanner for update can be done from the dashboard interface. The interface itself can be reduced to the basic functions of data protection by switching to a Simple View. This is a useful utility that is made available to NovaStor users who would like to know how much space they will be consuming with each backup or copy operation on their backup media. This tool is accessible by clicking on the copy or backup menu item available on the dashboard screen. Users will have to select the files and folders they plan to backup and click on the estimator tool to provide them with an estimate of the amount of space that the backup job will use up. 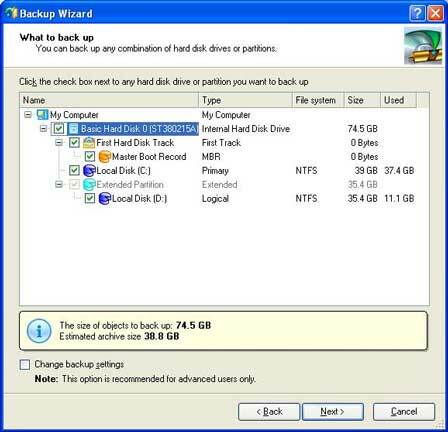 The backup wizard interface is designed for all types of users. The user may be a complete novice, keen to just backup and the C:// drive, or a discriminating user with a clear mandate of what and what not to backup. Returning users will find that they do not have to make a re-selection of the files and folders to backup, if they have wisely saved the backup as a job. All they need to do is to invoke the previously saved job, and the backup wizard will do everything that needs to be done. If the user chooses to manually select all the files and folders to be backed up, a Windows Explorer window opens with all the files and folders displayed in a hierarchical tree. 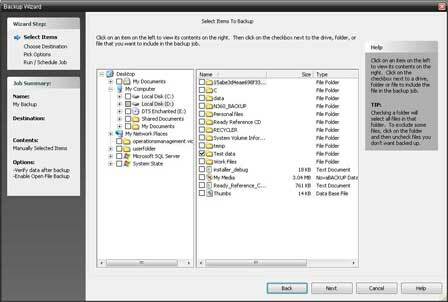 The user can navigate the tree and select the specific files and folders that make up the backup job and click on Next at the bottom of the screen to initiate the backup process. Each backup job can be given a unique identifying name. 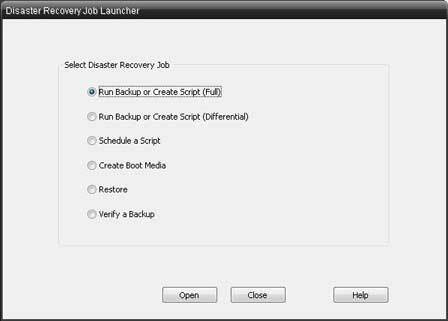 To restart the backup job, the user can begin the job by selecting the job name from the list of backup jobs which becomes instantly available on the backup wizard database. The user must also consciously decide whether the new backup job must be saved as a new version or overwrite the existing backup of the files and folders already saved under the same job name in the storage repository. If this is to be a new version, the user must inform the wizard whether the newly initiated backup mode must be a backup that is Full, Incremental, Differential, or a Snapshot. Before clicking the Next button, the user must specify where the backup must be stored. The backup can be stored on a partition of the hard drive, on a CD/DVD, a local device, on the network, or cloud storage. If the user has signed up for online storage, the online drive can be selected for the purposes of the backup. An entirely new folder with a unique name can be created for containing the files and folders in the backup to distinguish it from similar backups that may happen in the future or have already happened in the past. The next screen prompts the user to select all or one or more of the several options available to the user. The user can choose to use Software Compression and obtain a verification report on the state and quality of backup after the completion of the process. The user can also enable open file backup and virus scanning with specific action settings for dealing with infected files. A backup job can be an immediate backup, a one-time backup, a regularly recurring backup, or can be scheduled to kick start during a predefined backup window. The user has seven options — Run Now, One Time, Minute, Hourly, Daily, Weekly, and Monthly. While Run Now will kick start the backup on closing the Wizard, Minute will result in continuous backup. The other options will schedule the backups to specified time frames. The backup scheduling can be performed as a Logged in User or as a Specific User. The latter will be authenticated before the backup schedule is accepted, and one must input credentials for the purpose. The status of the backup job is visually displayed in the next screen by a horizontal progress bar in the next screen. The status of the job is also updated on the dashboard and is visible on the top left column of the screen, along with details of backup jobs scheduled for different times of the day, week or month. The Copy Wizard is intended to ease the task of creating and automating copies of files and folders. The selected files and folders will be replicated to the specified media — a partition of the hard drive, a CD/DVD or other local storage device, a network drive, or online storage. The copy process is similar to the backup process, and the wizard screens are the same. However, the copy wizard may be used to create a limited set of files and folders for collaboration or to share with employees or third parties, (who otherwise do not have access to such information) without compromising the mission-critical data of the enterprise. 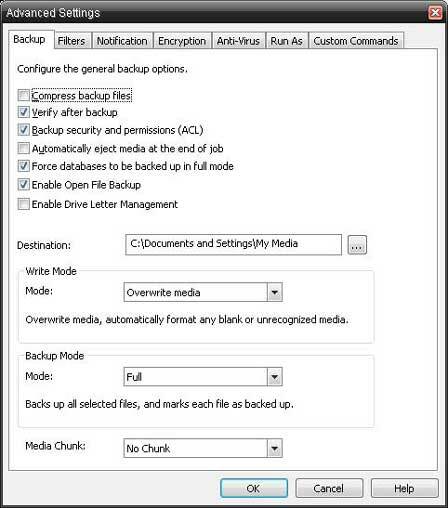 The advanced settings for backup and copy can be accessed from the menu bar by clicking on the Backup or Copy tab. The advanced settings button is available as a button at the bottom of the screen that appears on clicking the Backup or Copy tab. This screen contains a number of options to set up rights and permissions for users with reference to the backup job being created. Users can choose one or more of the options to optimize the backup. The backup set can be compressed to save on space. Also, the backup can be verified for defects after completion. In addition, backup security and permissions can be set. The media (CD or DVD or a USB device) can be ejected after the backup is completed. If the backup is the backup of a database, the system can be forced to ensure that the database is backed up in full mode. Drive letter management can be enabled and open file backup can be set as automatic. Under advanced settings, users can create Chunked backups of 1 to 4 GB or refuse to chunk the data that is being backed up. The other tabs visible on this screen indicate that the users can apply filters, initiate encryption, choose to be notified, invoke virus scans, run the backup as a specified or logged in user, or create custom commands that run before or after the backup job. 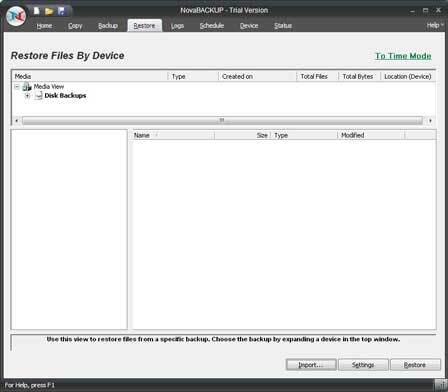 The restore wizard can be activated by clicking on the Restore Wizard link on the advanced or simple dashboard view or by clicking on the Restore menu option on the menu bar. The menu option Restore screen contains an Import button and the Settings button, which are absent from the Wizard screen that opens on clicking upon the Restore Wizard link on the dashboard. The import option allows the user to import files from any network drive or device for restoration on the machine from which the wizard is being invoked. The Settings button opens up the advanced settings screen that allows the user restore ACL permissions (in instances where the file is imported) or overwrite / not overwrite existing files, or to restore data to the original location or a new location. The restoration can also be incremental, full, or additional incremental for database restores. 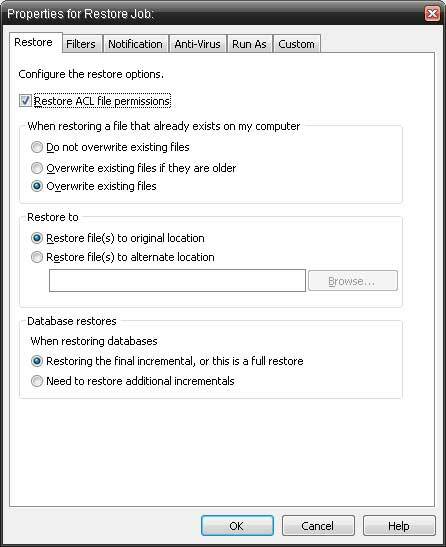 Users can also create filters, enable virus scans, run the restoration as the logged in user or a specific user and create custom commands for restoration that may be set to run before or after the restoration is complete. Users can also choose to be notified on the restoration operation. The restore screen is available in two modes — the Time Mode and the Device Mode to facilitate restoration on basis of time stamps or device. Disaster recovery is an important element in data protection. 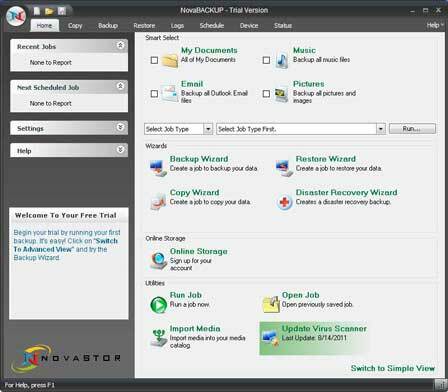 NovaStor offers a Disaster Recovery Wizard as one of its features. The wizard screens guide the user through the process of creating a set of files and folders that are considered essential for disaster recovery by the organization. These mission-critical files and folders can be stored on a partition of the hard drive, on any popular storage device or can be stored on a network drive.. On selecting the appropriate media button, a colorful Disaster Recovery Wizard screen pops up. 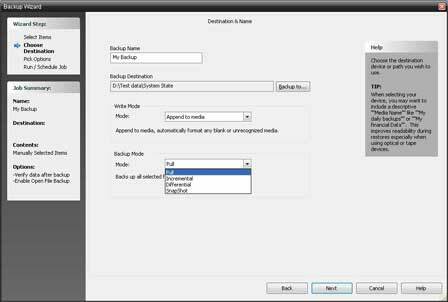 Users can choose to run a full image or differential image for disaster recovery purposes. They can schedule a disaster recovery script or create a boot media using this wizard. Additionally, they may also invoke a restore operation or a backup verification process. The backup or differential backup wizard initializes all existing backups and displays the data in file view or archive view. Users can select the appropriate files and folders for disaster recovery from the list of files in tree view or from the files available in the different disks, partitions, or network-based archives. They can back up any combination of hard disks and network devices. 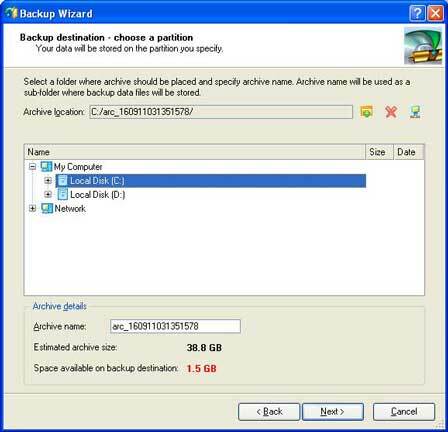 The total space required for the backup of the selected objects for backup is displayed at the bottom of the screen in a yellow box. The option to change backup settings is recommended only for advanced users. The next screen prompts the user to select the destination for backup. The user can back up the data to a local drive (by specifying the partition in the next screen) or to a network drive (by specifying the network device or online storage), or burn the data on to a CD/DVD. 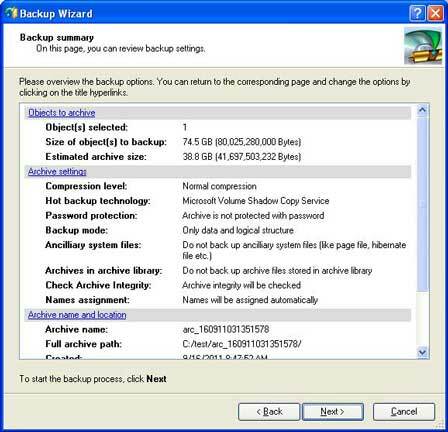 Once the above parameters have been specified, the wizard requires the user to enter reasons for the backup and then select when the backup operation is to be performed. 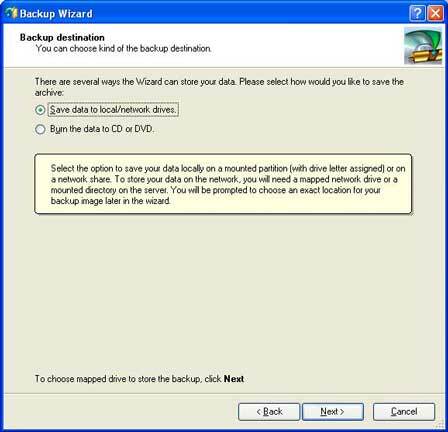 The last screen of this wizard is an overview of the backup options selected by the user on the Disaster Recovery Wizard screens. 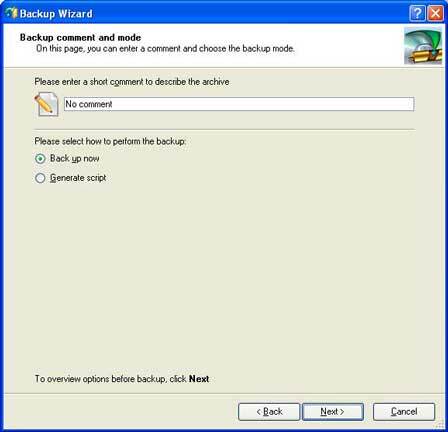 Upon clicking Next, the wizard initiates the backup if the user has elected to Backup Now, or waits in readiness to kick start at the time specified in the backup script. Online backup and storage is not automatically made available to users of NovaBACKUP Business Essentials and other NovaBACKUP products for single workstation and server protection. . Users must complete a separate sign up process and select their storage vendor. The NovaStor Offsite Backup Center screen that appears on clicking the Online Storage button on the dashboard details why users will benefit from signing up with a NovaStor-certified backup service provider. The form that is available at the bottom screen enables NovaStor to understand the user requirements and recommends service providers who can best meet the needs of the customer. Once the customer accepts the recommendation, the signup process is completed and NovaBACKUP Business Essentials user or any of the other NovaBACKUP products for single workstation or server protection user is connected to the offsite storage repository over the Internet. NovaBACKUP allows you to choose from three offsite backup options Certified NovaStor Partner, Amazon S3, or an FTP client. Such hybrid solution ability to backup offsite to a professionally managed data center and locally to an onsite storage device- is one of the best features in the industry today. NovaStor recommends choosing one of its certified online storage providers for offsite backup services. NovaStor is awarded four stars out of five on our rating scale. The software is robust and thoughtfully constructed to meet the different requirements of its customers. Onsite and offsite backup, storage and recovery can be all be accessed from a single interface. The wizards are simple to use and even a novice user will find the process of sign up, backup, storage, and recovery a breeze. NovaStor’s huge revenue generator is its stand-alone software. However, they have diversified their portfolio by adding hybrid solutions. It is worth noticing how they seamlessly integrate their desktop software to an online backup service the user chooses. NovaStor partners with international providers, with advanced technological infrastructures to provide secure online storage services to their customers. NovaStor has a very strong management team. CEO Stefan Utzinger is a veteran in the industry and has recently written his 20 plus years experience in a book, entitled, Channel Revolution. In this book, which is available as an eBook on iTunes, Amazon and Lulu, Utzinger details a pragmatic approach to successfully building an indirect IT sales channel. He also explains why, in times of the cloud, SaaS and increasing globalization, taking a revolutionary approach is the way to go and how to make it succeed. The book presents startling facts, strategic thoughts, down to earth calculations, as well as practical advice. Another prominent figure in the data storage world is EVP and Managing Director Mike Andrews. Mike, a veteran with almost two decades in data security and protection has been named a Storage Superstar by CRN Magazine. This is a testimony for NovaStor’s dedication in and to the industry. NovaStor is certainly highly recommended.